BMW produces a whole range of racing cars, based on its road-going production models, to compete in racing series around the world. Like the M4 DTM, M6 GT3, and M8 GTE. Now one of its most iconic models is returning to the track. 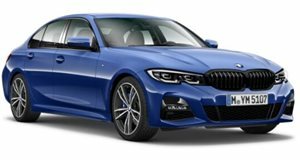 Pictured here for the first time, this 330i M Sport is based on the new 3 Series sedan. It's being developed by West Surrey Racing, which will field a trio of them under the Team BMW banner next season in the British Touring Car Championship to replace the 125i with which it won the title last year. It won't be the first time that the 3 Series will see action in the highly competitive BTCC. Between 1988 and 2009, Bimmer Threes won five drivers' and two manufacturers' titles in the series. WSR won the independent teams' title in a 3 Series three years running (2007-09) before switching to the 1 Series hatchbacks that have dominated for the past few seasons, which bodes well for this new model's chances. "The BMW 3 Series has a rich and successful history competing in the BTCC and we are extremely proud to see that tradition continue,” said BMW UK chief Graeme Grieve. The new 330i touring car will mark its race debut the weekend of April 6-7 at Brands Hatch. There it'll contend with racing versions of the Ford Focus RS, Honda Civic Type R, Mercedes A-Class, Audi S3, Toyota Corolla, Vauxhall Astra, Subaru Levorg, MG6, and Volkswagen CC.